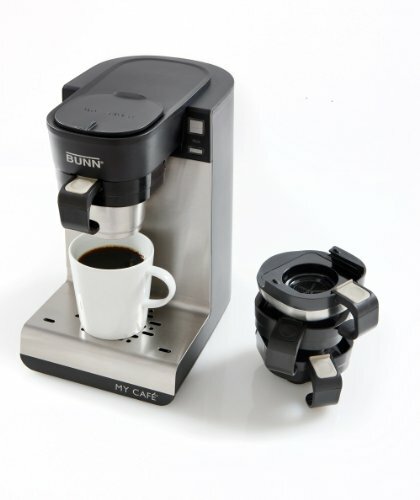 The Bunn MyCafe single-cup multi-use brewer is a versatile coffee machine that can accommodate older-styles K-Cups (i.e. not the 2.0 range) and ground coffee. The brewer also works with tea pods, tea bags, and loose tea, in addition to dispensing plain hot water on demand. There are separate, interchangeable drawers for each type of brewing. The Bunn MyCafe has a fast heat-up time of around 30 seconds and an internal water tank with 14oz capacity (there is no external water reservoir). Users can brew beverages of between 4oz and 14oz in size. The removable drip tray allows for a cup clearance of around 7 inches, to accommodate taller mugs. The brewer is not programmable and does not have an automatic on/off feature, although it does go into sleep mode after 26 hours of inactivity. 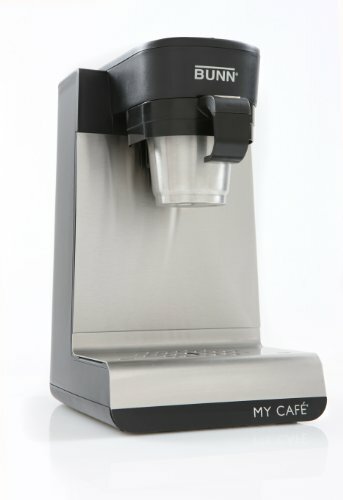 Overall, the Bunn MyCafe offers a lot for its $200 list price. You also use the brewer to make ice coffee – simply brew the coffee into a cup filled with ice and top up with milk. As you might imagine, this versatility is the Bunn MyCafe’s biggest selling point. Aesthetically, the Bunn MyCafe is a functional looking unit (not surprising given Bunn is known for its commercial brewers), with a gray, stainless steel body and black accessories/trim. While you might expect a brewer that offers so many brewing options to have extensive controls, in fact there are no fancy controls panels or dials. There is simply a brew button and red/green indicator light that tells you what’s going on. It should be noted there is no on/off button and no programmable time control. There are a couple of energy-saving features. After 6 minutes of inactivity, the temperature of the internal water tank drops to 140F (from an optimal 200F), taking around a minute to get back up to full temperature. After 26 hours of inactivity, the brewer enters ‘sleep’ mode, from which it takes around 2 minutes to reawaken and become ready to brew. If you want to shut the brewer off completely, you need to unplug the machine. 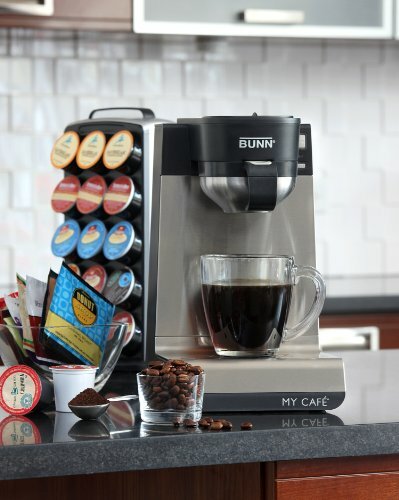 The Bunn MyCafe brews all the different types of beverage via 4 interchangeable drawers – K-Cup (including coffee, tea and hot chocolate pods), ground coffee, pod (for any size soft pods) and hot water. Each of these drawers is especially designed to produce the best brew. Simply select the right drawer for the type of drink you want to make, add the coffee, pod, or tea of your choice (or choose the hot water drawer) and slide it into the holder at the front of the machine. Place a suitable cup underneath the dispenser, add water, and push the brew button. On the issue of water, anyone familiar with coffee pod/Keurig machines will be used to filling an external water tank and brewing multiple cups before being prompted to refill the tank. The Bunn MyCafe actually works like a drip brewer, meaning you only add the water you need for each brew (between 4oz and 14oz). Internally, the water is stored at around 200F (although some third-party reviews dispute it actually gets that high). This helps boost beverage quality as it ensures fresh water is used each time. Note that the manufacturer recommends using water with mineral content (i.e. tap water) and some third-party users have reported problems when using bottled/distilled water. As to beverage quality, there’s no doubt the Bunn MyCafe can produce a fine brew, depending on the quality of coffee you use and also the ratio of coffee (or tea, etc.) to water. This brewer offers control over the amount of water you add, thus offering control over the brewing process. Note that it won’t be an exact science – meaning that if you add 8oz of water, you won’t get exactly 8oz of tea/coffee etc. As with all coffee machines, it’s worth taking some time to try different combinations. For ground coffee, a good place to start is with about 2 heaped tablespoons for 10oz of water. Of course, you can keep adjusting until you find the right strength. For a stronger brew, the Bunn MyCafe features a pulse brew option. Additionally, the brewer features a removable drip tray, which offers extra cup clearance for travel mugs (up to about 7 inches). Initial heat up time from switch-on is around 30 seconds, while the brewing process takes about a minute to complete. Before the first use, it is important to flush out the coffeemaker with clean water by running several brew cycles with plain water. After each use, the drawers, drip tray and drip tray cover can be removed and cleaned with hot, soapy water (or placed on the top rack of the dishwasher). The outside of the brewer can be wiped down with a soft, damp cloth and soapy water. Periodically, the brewer will require a deep clean. This involves running through a brew cycle using vinegar, followed by several cycles with plain water. Additional maintenance duties include removing and cleaning the spray-head and seal. Pros: The main advantage of the Bunn MyCafe is the fact it offers multiple brewing options, including older-style K-Cups, ground coffee and tea. It also dispenses plain hot water. Once you get familiar with all the separate drawers, brewing is quite straightforward. The brewer is capable of producing good quality coffee and tea. At around $200, the brewing represents good value for money, especially if you plan to make full use of its versatility. Cons: There are few bells and whistles on the Bunn MyCafe, which some users may miss. These include not being able to set a start time and a lack of an automatic on/off feature. There is no external water tank, so you need to add water each time you brew. Users switching from a Keurig brewer may find it takes a while to get used to the Bunn. While largely positive, some third party reviews have noted a plastic taste to the coffee and water leaking out during brewing. In a sentence? If you like variety, the Bunn MyCafe is an option worthy of consideration, as it offers the convenience of brewing older-style K-Cups, ground coffee, tea pods, tea bags, and loose tea for an investment of less than $200 – however, there have been some worrying third-party reports that might make potential purchasers think twice. The Bunn MyCafe has clearly been designed to be a multi-functional brewer that pleases all of the people all of the time. With its array of brewing options, this is certainly a versatile coffee maker that could be a viable alternative or replacement for your Keurig brewer, drip coffee maker, and even your kettle (given its tea and hot water capabilities). If you’re looking for this level of versatility (for $200, or less), the Bunn MyCafe is certainly a brewer worthy of serious consideration. There are, however, a few issues with this brewer that mean it isn’t a no-brainer purchase. Issues raised by third-party reviews include water leaking out of the unit while brewing, noisy operation, and even a few dud machines that failed to work immediately after purchase, or shortly thereafter. Of course, it’s unfair to judge a coffee machine by the odd dud unit, but if you’re considering investing in a brand new brewer it’s worth being aware of issues other users have experienced. There is also the issue of a plastic taste, but this can occur if the machine is not flushed out sufficiently before the first use.